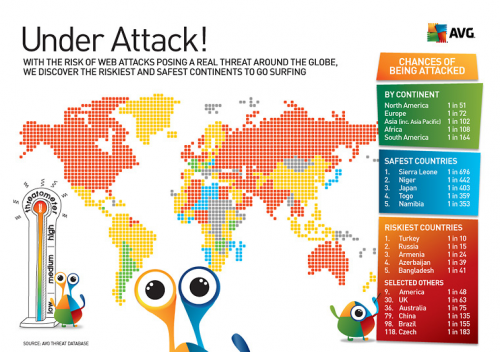 Here’s an interesting study by AVG on internet security, asking “Where in the World are you most likely to be hit by a malicious computer attack or virus?”. Apparently, and surprisingly to me, the answer is “not Africa” or South America. Keep in mind, this was over one week and it also doesn’t point directly towards where the attacks are originating from. Interesting data though, and not what I would have expected to see.